Travis Kauffman was born on August 21, 1985 in the small but rugged city of Reading, Pennsylvania. He was raised by his father Marshall, a self-employed single parent of two boys. Marshall Kauffman had a short boxing career, consisting of 7 amateur fights and 1 pro fight, but was forced to give up boxing to focus on his business and take care of his two sons. When Travis was nine, his father opened KING’s Gym (Kids In Need of Guidance) with the intent to keep inner city youth out of trouble. Travis would go to the gym and mess around, which eventually led to his first amateur fight at 9 years old against his brother Jason. Although the fight was considered an exhibition, this was his introduction to competitive boxing. He and his brother went on to fight 5 or 6 times after that. In 1995, following the death of his grandmother – who was like a mother to him – Travis quit boxing. Kauffman began getting in trouble and became a frequent visitor to the local juvenile detention centers. His run-ins with local troublemakers led to a severe beating at the hands of a group of thugs. This would prove to be a pivotal turning point in his life. One of the kids who jumped him was a boxer and Travis vowed to get back at all of them, one by one. Around that time his father was hosting the regional Golden Gloves and told his son that one of the kids who jumped him was entering the tournament. Travis entered the regional tournament, fighting and beating the kid to exact his revenge. Afterwards he continued to box, winning the Middle Atlantic tournament at 15. He was also picked to go to the 2001 Junior Olympics. Tragedy struck Travis on June 7, 2001 when his mother died one week before the tournament was to begin. Travis was devastated but insisted on winning the Junior Olympics for his mother. Although he did not win, Travis placed third and was very impressive in defeat. Unfortunately, when he returned home after the Junior Olympics, he was arrested for failure to inform his probation officer that he was out of town. While in juvenile detention center, he made a choice that boxing was his calling in life. Upon his release he moved into the open class of the amateurs. At age 17 he made it to the 2003 National Golden Gloves, reaching the semifinals only to lose to the 23-year-old Travis Walker. Walker went on to win the tournament, scoring all of his wins by knockout except for the close fight with Travis. Kauffman received a full scholarship to Northern Michigan University for boxing, but after 2 months he realized the boxing program wasn’t for him. At the time he was ranked number 3 in the USA Boxing rankings in the Open class. He was gaining valuable experience fighting the best amateurs from all over the world. One of his brightest moments came in 2004 when he won a Gold Medal at the Police Athletic League Nationals. 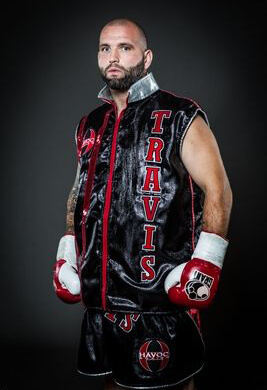 Travis had one of the best performances of all-time in that tournament, scoring an :18 knockout against Nagy Aguilera. In 2005 he was undefeated in international tournaments, winning the gold medal at the Jose Cheo’ Aponte tournament in Puerto Rico and the USA -vs- Azerbaijan duel in Harvey, Illinois. In the USA -vs- Azerbaijan finals, Kauffman faced off with 2000 Olympic bronze medalist Vugar Alakbarov. Nursing an ailing right wrist, Kauffman fought the entire fight as a southpaw to great effect. Kauffman won every round on the scorecards. Following that spectacular performance, Kauffman felt his time in the amateurs was over and decided to pursue the glories of professional boxing. In only four years of competition, Kauffman compiled a 52-12 record and was ranked number one in the country. Travis made his pro debut on January 26, 2006 against Jerome Boyer in Glen Burnie, Maryland, stopping him in the second round. On December 5, 2008, Kauffman made his national TV debut with a third round knockout of once-beaten Malachy Farrell on ShoBox: The Next Generation. Despite giving up 60 pounds in size, Kauffman was able to floor Farrell for the first time in his career in round one and remained in control for the duration of the fight. Kauffman followed that performance up with a pair of early knockouts against trial-horses Ken Murphy and Cliff Couser. Kauffman then suffered his first loss to Tony Grano in a controversial stoppage in 2009 and has pleaded for a rematch numerous times to be turned down every time. In 2015 Kauffman faced former tirle Challenger Chris Arreola and lost in a controversial majority decision loss. In rd 3 Kauffman dropped Arreola and seemed to dominate the entire fight but was not given the decision. Later on decision was changed to a no contest due to Arreola failing a drug test. Away from the ring Travis is a single father of 3 boys. Travis Jr – 11yrs old, Christian Anthony – 8 yrs old, and Jeremiah Marshall – 5 yrs old.. He also raised 2 other kids as his own, Julius and Nevaeh who are currently 18 and 17.. Being a father is one of the best things in the world. It makes me a very strong person. I love my kids, It’s a blessing that has made me grow up and be a man and being a father taught me so much. Trying to balance his career and the fact he is a single father of his 3 biological kids has definitely been a challenge and not 1 of the easiest things to balance but thus far Travis has done an outstanding job.